Aarsun Woods brings to you Handmade Wooden Room Divider / Partition Screen for your home and restaurants. Our Partitions comes in a standard size each panel of 6 feet approx. in height (72 inches approx.) and 18 inches in front width. The Room Dividers are used to separate a space from the whole area and acts as Privacy Screens. The unit is a blend of Mango Wood & MDF (Medium Density Fiberboard) handcrafted by skilled artisans. 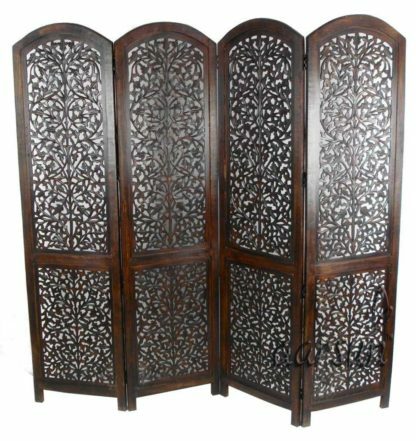 The Room Divider is hand-buffed in Antique Finish (Matte) and is available in a number of trendy shades and designs which adds a classy yet elegant feel to your living room.four panel Mango wood Room divider in rich antique deep chestnut featuring intricately carved floral motif and lattice details. A superb way of improvising your home decor. The Room Divider is easy to clean and maintain. Moreover, it can be customized as per your requirement. Want a different Design / Size? contact us at +918192999135 or chat with us right now to get assistance regarding the best wooden room divider as per your requirement. 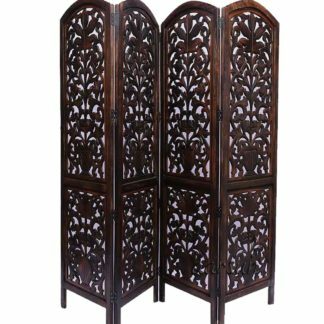 In case you are looking for Sheesham Wood Room Divider , have a look at Handmade Sheesham Wood Partition, also in case you require fine carving in Sheesham. Aarsun Woods Partition Screen are also available on popular e-commerce portals such Amazon India, Flipkart, Pepperfry, and more.. Product received in good packaging and the product itself is of very good quality.Adds a touch of class and elegance to the living room. Overall, I am very satisfied with this purchase and will recommend it without hesitation.Hope this review helps you to make a decision. Good look,worth for money, that color ok totally am well satisfied thanks to aarsun woods to make my home swanky…..
A very good product with good finishing. Good packing for delivery too. Quality of the product was very good. Delivery time was up to the mark. great stuff and very prompt delivery ! Worth every penny spent, It initially smells of varnish but just keep in sun or in an well ventilated area, it will go. A wonderful addition to your house. Pretty decent. Packed Well and delivered in good condition. Description matches the product. Hope that the wood used will last long. Competitive price point. Can seriously consider buying. Thanks Aarsun!